August 5 – 7th, I went to Tokyo to attend the Fourth Extensive Reading World Congress (ERWC). 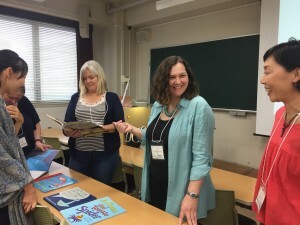 This is an international conference where teachers all over the world get together to present on and discuss the latest research and methods of extensive reading (ER). 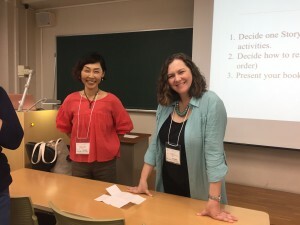 The first teaching conference I ever attended overseas was the Third ERWC in Dubai, UAE, and I was really surprised to discover that about a third of the attendees were teachers from Japan! However, this conference I met many teachers from Russia and other Asian and South American countries. Another difference was that at the last ERWC, there were few presentations on using ER with children. There were a lot more in Tokyo this time. I had a great time meeting Aurora Varona Archer, who is doing her PhD on ER with children in Mexico, and attending her presentation. Also, Chiyuki Yanase and I had a small but very enthusiastic group at our 75 minute workshop on the story based approach. This approach uses shared reading activities in class to help promote literacy, enjoyment of books and stories, and encourage students to read more on their own. In this presentation I had the opportunity to demonstrate lessons I have used at BIG BOW English Lab, using the picture books, Brown Bear, Brown Bear, What Do You See? and Me on the Map. Chiyuki demonstrated activities she has used in her classes using the books Shh! We Have a Plan and Pete the Cat. Joanne Sato, who unfortunately was not able to attend the conference, worked many months before to ensure that there would be a panel discussion about ER libraries for children. 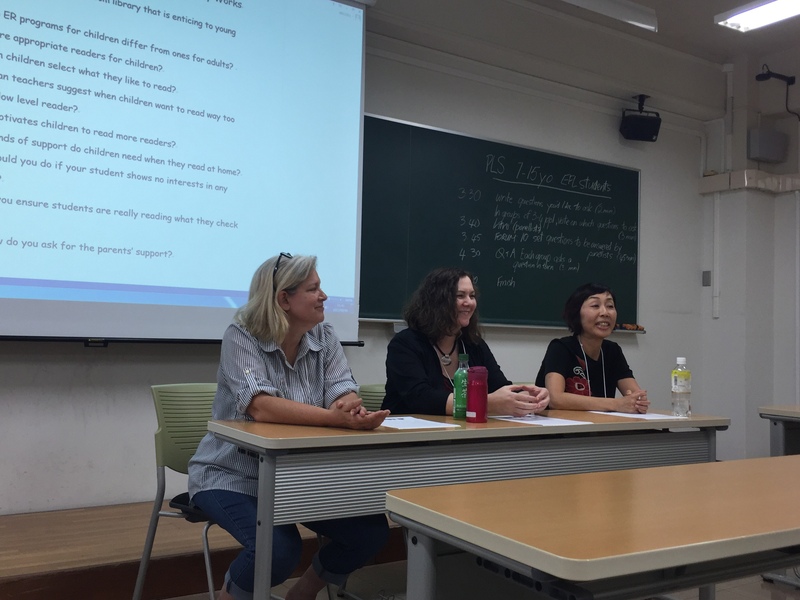 Laura McFarlane, Chiyuki Yanase, and I were the panel members and had a lively discussion with the audience about how ER libraries for children differ from those for university students and what works well in our own libraries. Akio Furukawa very graciously invited any ERWC attendees to come and observe one class at his juku school, SEG, so that’s where I went my last day in Tokyo. 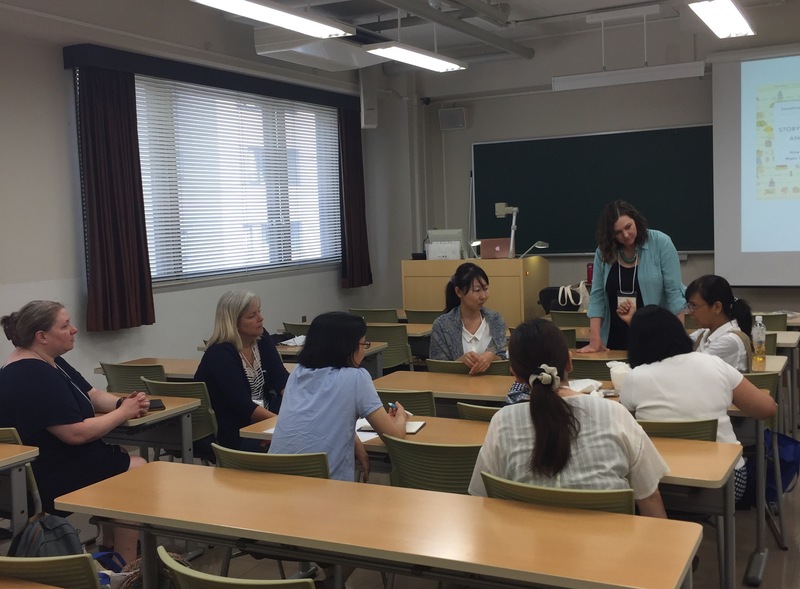 SEG has one of the largest libraries of English books in Japan and has a very good track record of helping students learn English and do well on their university entrance examinations through the use of ER. I attended one of his presentations at ERWC and was surprised to hear that after years of solely promoting ER, that they have recently concluded that just reading is not enough. Therefore, an interactive story creating class called TPRS has been introduced at SEG. I observed the extensive reading class. There were about ten, mostly second year junior high school students in the class. The first hour of the 80 minute class the students silently read on their own, sometimes listening to the audio provided with the story using portable CD players and earbuds. Instead of students choosing books themselves, as in the typical ER program, Furukawa-sensei chose the books for the students, based on the student’s level and books they have liked in the past. He also chose some interesting books for me to read, mostly controversial picture books that have been featured in the news! The students keep a record on what books they have read, the word count, and their review of the book. After the first hour, the students took a speed reading and comprehension test. The last ten minutes, I was invited to come to the front and talk to the students. After my self-introduction, we talked about what books we liked to read. Unfortunately I had to hurry back to Nagoya after the class was over because of the approaching typhoon, but I really enjoyed going to the ERWC and have lots of ideas on how to improve my reading program and library.